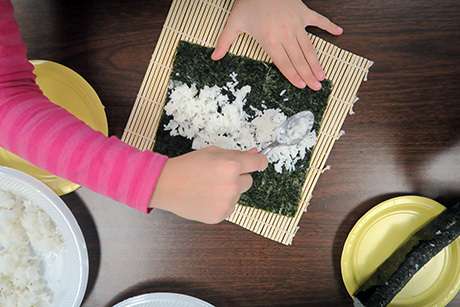 I conducted a sushi-making activity with third graders in northwestern Ohio this past fall. In the photo, a young participant carefully adds the rice to her creation. Some students liked the sushi and some didn’t—the seaweed was a turn off, I guess. Many of the students said “ewww” and giggled. This was very interesting for me since it is very common for us to eat seaweed like “wakame” and “nori” but not for the American children. It was slimy and foreign! At first, some students didn’t even wish to try our creations, but once they did, they liked it! At the end of the activity, students who liked the sushi asked to take home the leftovers (including the ones their friends didn’t want to eat)!